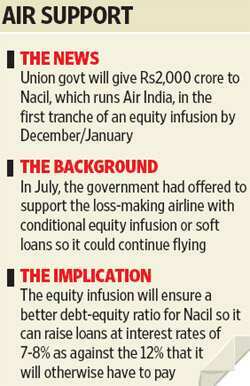 Mumbai: Debt-ridden National Aviation Co. of India Ltd, or Nacil, which runs Air India, will get Rs2,000 crore in the first tranche of an equity infusion from the government by December or early January, two civil aviation ministry officials said. The government, which has previously extended the national carrier sovereign guarantees on loans to buy aircraft, had in July offered to support the loss-making airline with conditional equity infusion or soft loans so it could continue flying and add to its fleet and can compete with rivals at home and abroad. “We are talking to the finance ministry to extend a sovereign guarantee that will help recast some high-cost working capital loans of Air India," the official said. “We are moving a proposal to the cabinet in consultation with (the) finance ministry for getting a sovereign guarantee. No time frame is set for this." The government typically extends sovereign guarantee to public sector firms only for large borrowings and not for normal working capital loans. The two officials did not want to be identified. Air India’s schedule has been disrupted after pilots went on strike on Saturday in protest against the management slashing incentives by as much as half to curb costs as the financially strapped carrier tries to stem losses ahead of the government rescue. The equity infusion will ensure a better debt-equity ratio for Nacil so it can raise loans at interest rates of 7-8% as against the 12% that it will otherwise have to pay. Nacil’s current equity capital is Rs145 crore. The equity infusion will be given in three tranches over three years, with Rs2,000 crore in the first, another Rs2,000 crore in the second and Rs1,000 crore in the final one, the official said. With accumulated losses of Rs7,200 crore and borrowings of up to Rs15,241 crore at the end of June, up from Rs6,550 crore in November 2007, Nacil had asked the government for a loan and equity infusion of around Rs15,000 crore. In a 25 July meeting, the committee of secretaries, or CoS, had suggested Nacil prepare a cost reduction proposal, including an alternative for its performance-linked incentives (PLI), to justify an equity infusion or any soft loan grant. In the last week of August, CoS reviewed Air India’s turnaround measures and asked for more aggressive cost cuts. On 23 September, Air India said it would cut incentives for officers and top managers by up to 50%, resulting in a protest call by some pilots. The reductions will be with effect from August. On Sunday, the second day of a strike by some of its executive pilots, Air India had to cancel at least 30 domestic and international flights. Late Sunday evening, Air India announced it would set up a committee to look into the concerns of the pilots. A spokesperson for the carrier said the incentive cuts would not apply till the committee takes a decision. The committee will include executive pilots as well as members of the the company’s management. The announcement came after a meeting between Air India chairman and managing director Arvind Jadhav and 20 executive pilots from Mumbai. But V.K. Bhalla, a New Delhi-based representative of the executive pilots, said the issue is not resolved fully and pilots in Delhi, Chennai and Kolkata are going ahead with the strike. The ministry official quoted earlier in the story would not comment on whether the strike would jeopardize the equity infusion. “We had asked them to come out with a cost reduction plan. But pilots are now showing how they can contribute to it," he said sarcastically. The airline’s decision to cut PLI would cover 7,000 of 31,500 employees, and result in savings of at least Rs750 crore. Air India now includes employees of the erstwhile domestic carrier Indian Airlines. “All employees need to have a better appreciation of the difficult market environment in which the industry is operating and (which is) affecting all airlines, and not just Air India alone," said Jitender Bhargava, executive director, corporate communications, Air India. “We cannot go back to the government every year begging for money." Another Air India executive said the airline is also looking to cut fuel costs and has engaged an International Air Transport Association, or Iata, consultant for this. He didn’t want to be named. Air India is eyeing potential savings of $198 million (Rs950.4 crore) a year from lower fuel costs.